Connect the voltmeter (+) terminal to terminal 7 (+1) of the connector, the voltmeter (-) terminals to terminal 2 (EW) of the connector. Connect the battery (+) to terminal 17 (+B) of the connector, the battery (-) to terminal 2 (EW) and 16 (+S) of the connector. Turn the wiper switch to INT. Connect the battery (+) to terminal 16 (+S) of the connector for 5 seconds. Connect the battery (-) to terminal 16 (+S) of the connector. 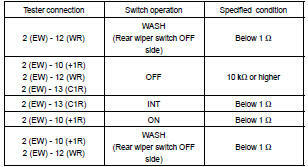 Operate the intermittent wiper relay and check voltage between terminal 7 (+1) and terminal 2 (EW). Connect the positive (+) lead from the battery to terminal 17 (+B) and the negative (-) lead to terminals 2 (EW) and 16 (+S). Connect the positive (+) lead from the voltmeter to terminal 7 (+1) and the negative (-) lead to terminal 2 (EW).Turn the washer switch ON and OFF and check voltage between terminal 7 (+1) and terminal 2 (EW). Connect the positive (+) lead from the battery to terminal 1 (+1) and the negative (-) lead to terminal 5 (E), check that the motor operates at low speed. Connect the positive (+) lead from the battery to terminal 4 (+2) and the negative (-) lead to terminal 5 (E), and check that the motor operates at high speed. Connect the positive (+) lead from the battery to terminal 1 (+1) and the negative (-) lead to terminal 5 (E), and operate the motor at low speed and stop the motor operation anywhere except at the stop position by disconnecting positive (+) lead from terminal 1 (+1). Connect terminals 1 (+1) and 3 (S). Connect the positive (+) lead from the battery to terminal 2 (B), and check that the motor stops running at the stop position after the motor operates again. Connect the positive (+) lead from the battery to terminal 1 (+B) and the negative (-) lead to terminal 3 (LS), and check that the motor operates. NOTICE: The body earth should be connected. Connect the positive (+) lead from the battery to terminal 1 (+B) and the negative (-) lead to terminal 3 (LS). With the motor being rotated, disconnect terminal 1 (+B) and terminal 3 (LS) to stop the motor operation at any position except the automatic stop position. Connect the positive (+) lead from the battery to terminal 1 (+B), and check that the motor is restarted and automatically stopped.